New York Times bestselling author Eric Shaw Quinn is back in this hilarious whodunit taking readers on a dishy insider’s tour through Hollywood’s bedrooms and backlots. When ghostwriter Paige Blanche gets unceremoniously fired by mega-celebrity Angela Panderson, the most famous woman in the world — known to her fans as Angel — Paige is left destitute and more than a little bitter. A chance encounter between the two rivals on the night of the party celebrating Angel’s engagement to a billionaire media mogul publicly reignites their feud. Hours later the body of Angel’s murdered fiancé turns up in her hotel suite. Clearly being set up, Angel arrives at Paige’s door, covered in blood and pleading for help from the last man on earth who’d want to help her and the only one who can’t turn her down. Together, the two embark on a madcap romp through the looking glass of Hollywood as they try to solve the murder, clear their names, and get a three picture deal in the process. Written with the same scathing wit and unflinching insight that has made its beloved author the host of his own popular podcast TheDinnerPartyShow.com, Write Murder is a cross between The Devil Wears Prada and the novels of Jackie Collins, a can’t miss read for fans of Hollywood secrets and satire. Eric Shaw Quinn is the co-host and executive producer of the popular podcast, TheDinnerPartyShow.com. Aside from his debut novel Say Uncle, he has published two books based on characters from the hit Showtime series Queer as Folk. His work as a ghostwriter for a certain celebrity earned him the distinctive title of Amazon’s #1 chick lit author for 2004. 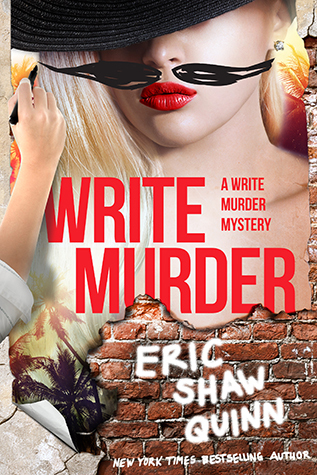 Write Murder is the first in his all new mystery series.